It's nice that in this crowded and constantly travelling world where all the paths have been well-trodden, all peaks - climbed and all the sights – shown more than enough, there is still one place so much unexplored, unknown and well preserved that the tourists can feel truly like a discoverer. A very difficult to reach place, a place that knows its price, very very special place - Bhutan! A closed territory until recently, now this small Himalayan Kingdom reveals to the curious stranger everything he dreams of - stunningly beautiful and preserved nature, untouched traditions, strange architecture and a genuine way of life that followed the ancient Buddhist religion for centuries. These reliable baits would have turned Bhutan quickly in another crowded touristic destination if it wasn’t for the strict laws in Bhutan for tourism development which allow only a very limited number of lovers of authentic experiences to visit the country. We would like to offer you to be one of those lucky ones, for which Bhutan will not remain only a dream! This tour is for those of you who love long walks in the mountains and sleeping in high mountain camps under the stars. You will be accompanied by yak herds, the musical background - the roar of the rivers in deep gorges, and the decor - the sacred peak Jomolhari. But before you taste this natural delicacy will have the opportunity to get acquainted with dzonga - Bhutanese unique public buildings and also to enjoy the most iconic views in Bhutan - to the monastery of Takstang "Tiger Nest”! 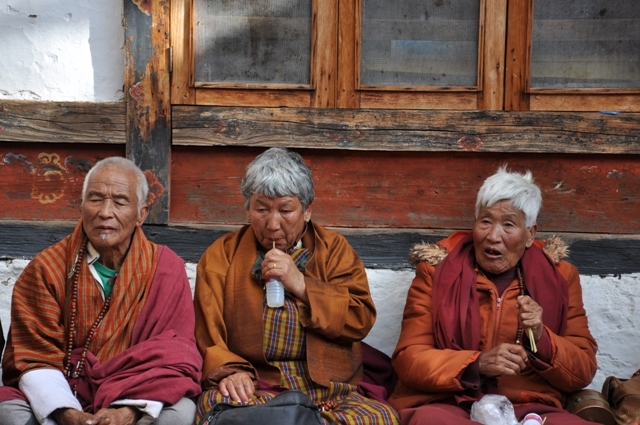 ♦ Bhutan – the cradle for Tibetian Bhuddism; with well preserved traditioner, a specific life style and architecture. ♦ Jigme Dorji National park - Bhutan’s biggest protected area (ca 4369 kv km) with great climate variation offering a reach plant and animal varieties – snow leopard, tiger, black bear etc. 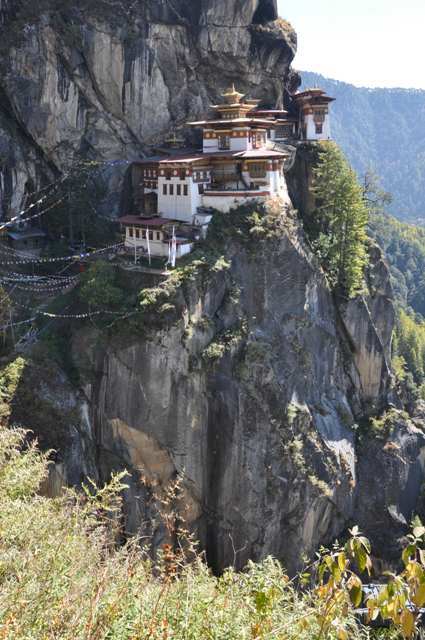 ♦ Dzongs (castles) – the landmarks of Bhutan are the castles built on steep slopes and other difficult to reach places. Nowadays these are the symbols of stability and optimism for the future. During the flight you will enjoy amazing views of the Himalayas Mountains. Meet and greet at the airport and lunch at the hotel. Visit of dzonga Paro-Rinpung built in 1645, now used by the local administration and the monastic school. The central watchtower is one of the most beautiful in the country. Later drive to Kyichu Lhakhang. Built by the Tibetan King, Songtsen Gampo in the 7th century, it is one of the oldest and most sacred shrines of Bhutan.Overnight in a hotel. Either on foot or on a horseback, the trail takes us to the place where we can enjoy an exceptional view to Takstang – the Tiger Nest - monastery, built on a cliff almost 700 m above the valley at 3100 m a.s.l. In the cave which served as home to the monastery Ringpoche Guru used to meditate. The legend has it that the guru flew over from Tibet on the back of tigress. In April 1998 a fire destroyed big part of the monastery but now it is fully reconstructed. Afternoon visit to Ta Dzong, built in 1651 as a watch tower and in 1968 inaugurated as Bhutan’s National Museum. The collection includes art, relics, religious thangkha paintings, postage stamps, coins and handicrafts as well as a small natural history collection. Overnight at the hotel. First day is an easy trek to start with, while the trekking crew get ready, start walking along the Paro River, following it as it winds along past traditional farmhouses with cultivated fields of red rice, chilies, potatoes and millet. After five hours of walking, arrive at the campsite by the river near the village of Shana(2860m). 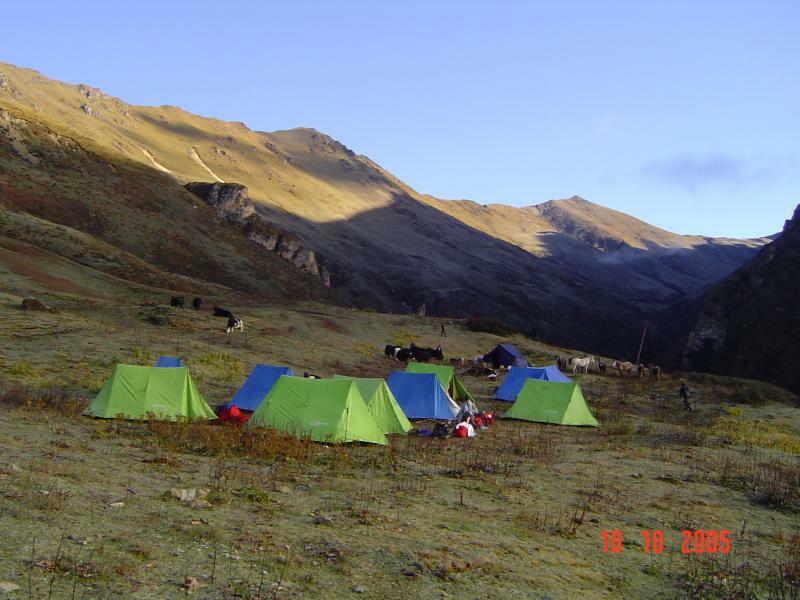 By this time trekking crew will have passed us and prepared the campsite. Overnight in camp. Duration and length of the trekking: 4-5 hours, 17 km, ascent / descent: 360 m/80m. During this long day itinerary makes a lot, but no long ascents and descents. Climbing along the river, the trail soon enters the territory of National Park, Jigme Dorji. 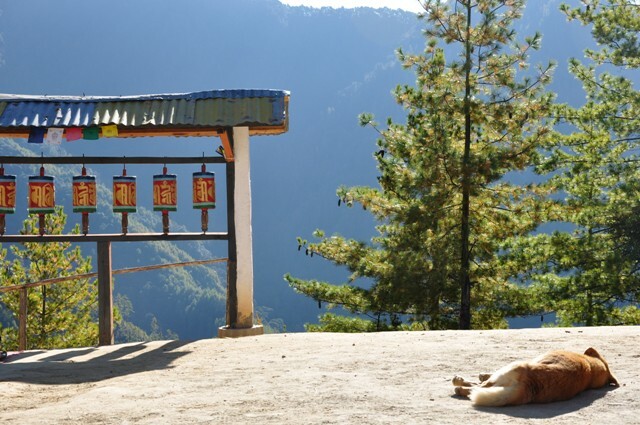 Continue walking up through the valley of the Paro river, which gradually narrows as the trail leads higher, winding up and down through the thick forest of oak, pine and juniper. As we get closer to the campsite, we begin to see the snow capped mountain of Jumolhari. Camp at Thangthangkha (3610m) amidst the woods. Overnight in camp. Duration and length of the transition: 7-8 hours, 22 km, ascent / descent: 770 m/10m. 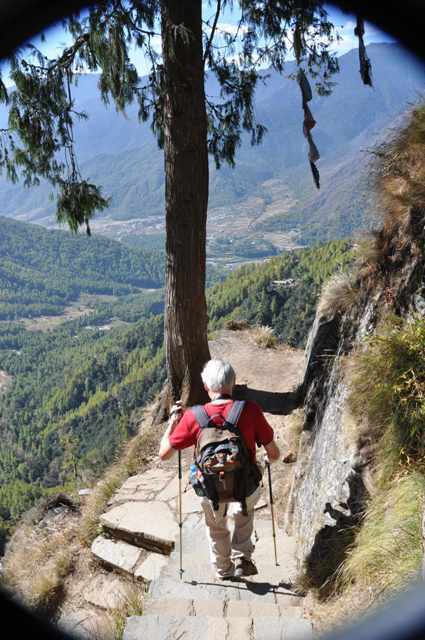 In the morning the trek continues along the valley of Paro Chu - a wonderful puzzle of Alpine meadows and small forests. The road crosses a military station. Chains of snow peaks and yak herds are an integral part of the landscape and view changes only by the villages of Ko, Taketang, Jangothang. When we reaching Jangothang, one of the most beautiful camps in the Himalayas, a beautiful view opens in front of us to the Jumolhari peak. 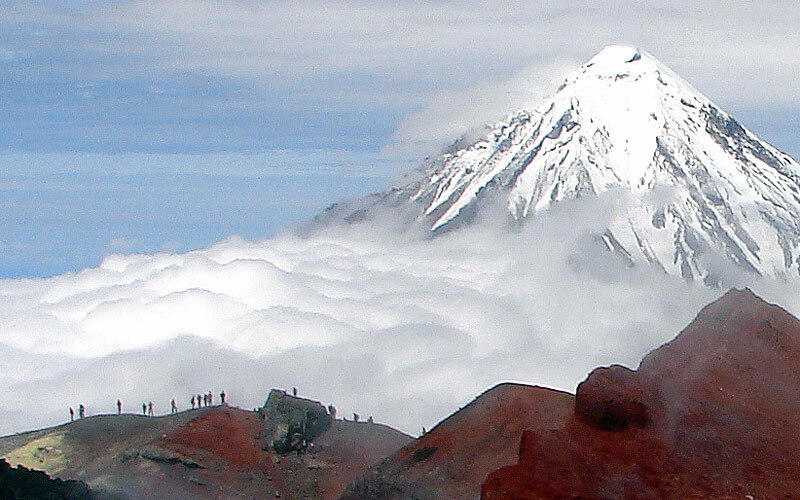 Duration and length of the trekking: 5-6 hours, 19 km, ascent / descent: 480 m/0m. The day spent in camp Jangothang offers many opportunities for day walks with glorious views of the lakes and the snowy pyramids of Jangothang and Jichu Drake. The camp is the perfect place for acclimatization. Good trails for short hikes start in three directions. Jumolhari and its chain of peaks lies straight to the west, Jichu Drake to the north and to the east beautiful mountains complete view. The trail leads to the end of the valley slopes to the Paro Chu. Along the Tshophu lake (4380 m) we follow a steep ascent to Bonthe La Pass (4890 m), highest point in this trek. On a clear day from the pass you can see the Mt. Kanchenjunga, the third highest peak in the world. Along the trail you will come across the yak herders’ tent, woven out of yak hair. After lunch make a long steep descent to the yak herders village of SoiYaktsa and camp for overnight at 3800m. Duration and length of the trek: 7 hours, 18 km, ascent / descent: 810 m/1090m. 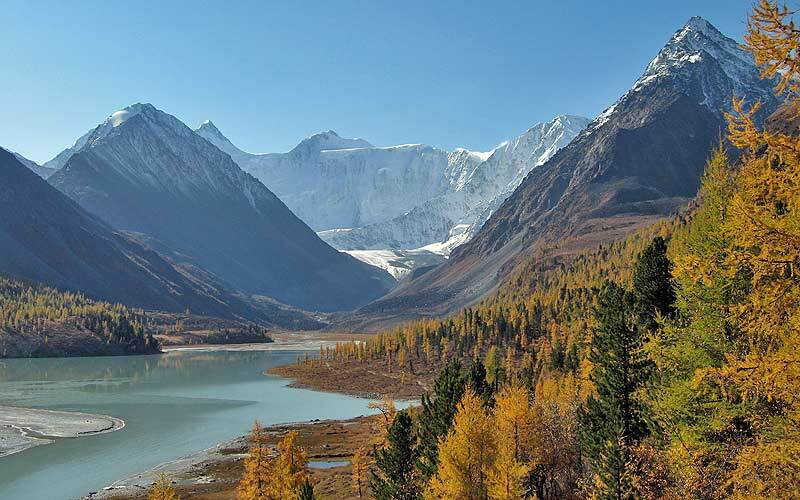 The trail starts with gentle uphill climb to the top of the eastern ridge of the SoiYaktsa valley. From here we will enjoy the views of the mountains in the north. The tips of the Jumolhari and Jichu Drake reappear on the distant horizon as you approach your lunch spot. Cross Takhung La (4520m) and after a short descent leads into a wide and grassy Thangbushong valley. 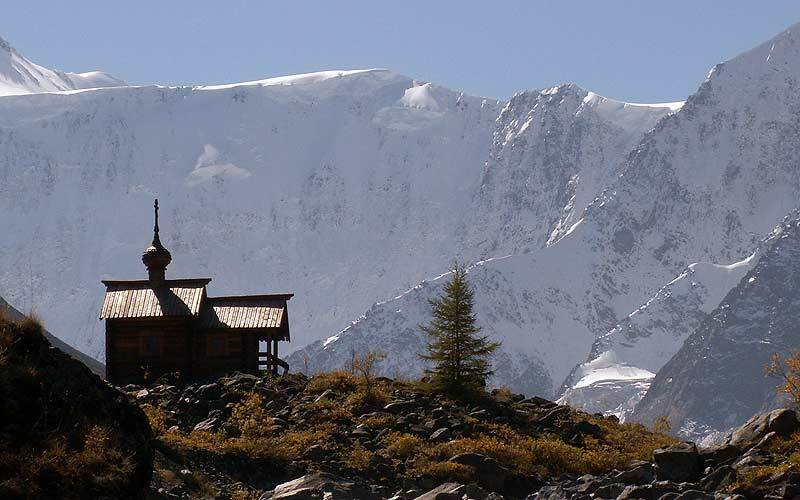 You will come across nomadic yak herders camped in their traditional woolen tents and stone huts. After a short steep climb from the original camp, we leave the remote mountain valley by following a ridge to Thombu La (4380m).From this point you can get glimpse of the Paro valley to the south and mountain views all around. Then steep descent trail most of the afternoon leading to the campsite at Shana (2730) where you had spent first night of camping. Campsite may differ; the crew may camp further down. Overnight in camp. Duration and length of the walk: 6-7 hours, 15 km; ascent / descent: 720 m/340m. Crossing the village at Gunitawa mostly comprising of army personnel and their families posted there. Transport will be waiting at the Drugyel Dzong to pick you up and drive to hotel. Overnight at the hotel in Paro. Duration and length of walk: 5 hours, 17 km, ascent / descent: 200 m/1650m. After early breakfast drive to Thimphu, the capital town of Bhutan with en-route stop at Chuzom, the confluence of Thimphu and Paro rivers. Three different style of stupas: Tibetan, Nepalese and Bhutanese adorn this confluence. The capital town of Bhutan and the centre of government, religion and commerce, Thimphu is a unique city with unusual mixture of modern development alongside ancient traditions. On arrival, check into the hotel. Then proceed for a guided tour of the city’s main highlights: Textile Museum - exhibitions introduce the major weaving techniques, styles of local dress and textiles made by women and men; National Library - besides thousands of manuscripts and ancient texts, the library also has modern academic books and printing blocks for prayer flags; Institute for Zorig Chusum - commonly known as Arts and Crafts School or Painting School, the Institute offers a six-year course on the 13 traditional arts and crafts of Bhutan. On a visit, one can see students learning the various skills taught at the school; Folk Heritage Museum - dedicated to connect people with the rich Bhutanese Folk heritage and rural history through exhibits. Lunch is followed by a city tour that includes: Changangkha Lhakhang - a fortress like temple and monastic school perched on a ridge above Thimphu; Memorial Chorten - the stupa built in the memory of Bhutan's third King, His Late Majesty, King Jigme Dorji Wangchuk, who is popularly regarded as Father of modern Bhutan; Buddha Point (Kuensel Phodrang) - you can pay your obeisance and offer prayers to the Buddha, the largest statue in the country and then walk around and take a glimpse of the valley. Conclude the tour of the day with a visit of Trashichhoe Dzong, “fortress of the glorious religion”. This is the center of government and religion, site of monarch’s throne room and seat of Je Khenpo or Chief Abbot. Overnight at the hotel. After early breakfast, transfer to Paro airport for the flight to Delhi. tourist visa for Bhutan. OBS. All our tours are based on double occupancy. However,if you travel alone and no room partner can be arranged,or you do not want one,you should be prepared to pay single room supplement (according to the price list for the particular tour). cigarettes and other personal expenses.